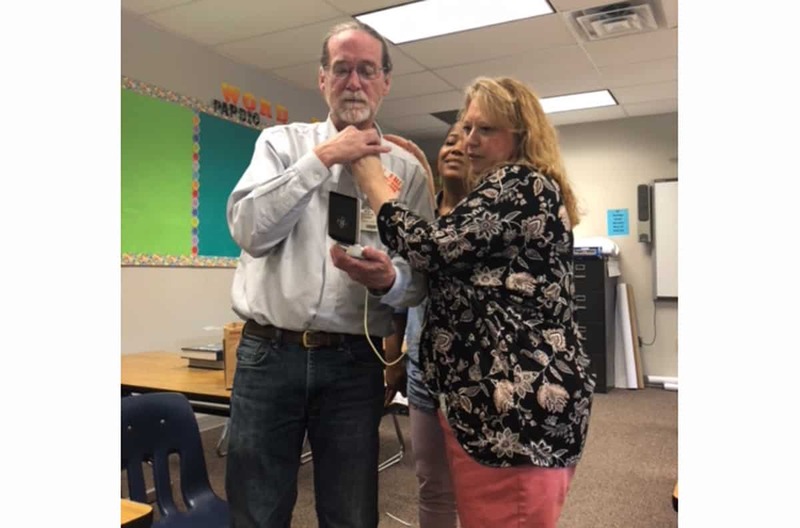 Kevin D. Phelan, Ph.D., demonstrates a handheld ultrasound device on himself to teachers at Hall High School. Phelan has received a $1.27 million grant to use the devices and other hands-on technology for a curriculum in the Little Rock School District and summer camp at UAMS, with the goal of increasing student interest in science, technology, engineering and math careers. Sept. 26, 2018 | Sept. 26, 2018 | The University of Arkansas for Medical Sciences (UAMS) has received a $1.27 million science education research grant to teach Little Rock School District students about STEM careers and cardiovascular health using handheld ultrasound devices and other interactive technology. The five-year Science Education Partnership Award (SEPA) comes from the National Institute of General Medical Sciences, part of the National Institutes of Health. The program is a partnership with the Little Rock School District and will include activities at both institutions. UAMS faculty will bring programs to ninth-grade physical science classes in the district. The UAMS campus will also host week-long summer camps each year of the grant, and some students will be invited back in subsequent years to deepen their engagement with science by becoming members of the camp staff. Teachers in the Little Rock School District try the handheld ultrasounds. The project’s overall aim is not only to teach individual students about science, technology, engineering and math (STEM), but to research the most effective ways to inspire students to pursue STEM careers. Kevin D. Phelan, Ph.D., co-director of the Division of Clinical Anatomy in the UAMS College of Medicine, is leading the program, which is called ArkanSONO. 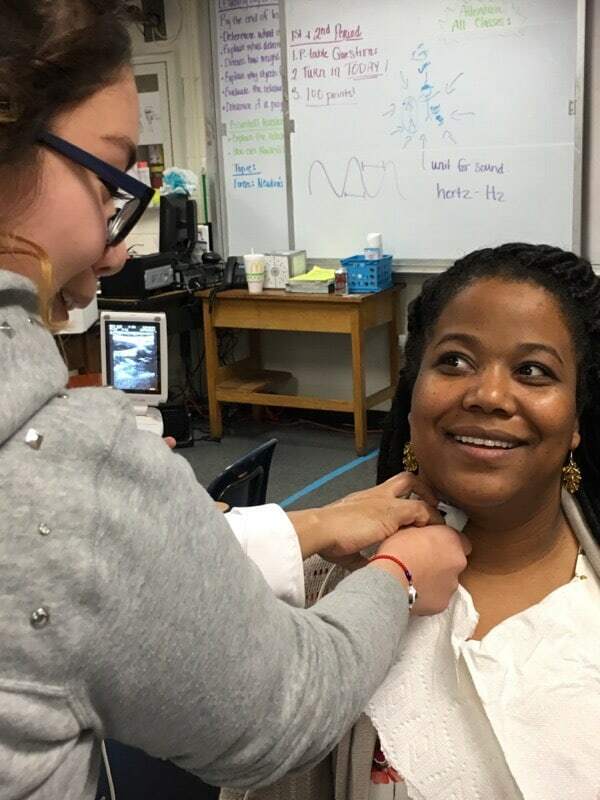 In the high school science classrooms, UAMS faculty will use real medical-grade handheld ultrasound devices to teach basics about the physics of sound, how ultrasounds work and how they are used in various STEM fields, including medicine, biomedical research and industry. Phelan conducted a pilot study in spring 2017 at four of the five high schools in the district. During the classroom visits, students will also be able to interact with smaller versions of UAMS’ Sectra Table, a virtual dissection tool that allows students to explore human anatomy in 3D with simple gestures similar to those on a smartphone. By the end of the classroom series, the students will use the ultrasounds to conduct their own experiments, using critical thinking and the scientific process to predict how the ultrasounds will interact with common objects. At SONOcamp, students will be able to use the ultrasounds on “standardized patients” — actors who portray patients for teaching purposes — so that they can explore the heart. They will learn about cardiovascular health, including the importance of exercise, a healthy diet and refraining from smoking. Students will interact with role models and mentors from a variety of STEM fields as well as current UAMS students from diverse backgrounds. Participants will put what they’ve learned to the test at the SONOlympics, during which they will use many of the real-life ultrasound skills they’ve learned to solve problems and complete tasks. Phelan is joined in administering the grant, program and accompanying research by Gregory Snead, M.D., chief of the Division of Emergency Medicine Ultrasound in the UAMS College of Medicine Department of Emergency Medicine; Billy R. Thomas, M.D., UAMS’ vice chancellor for diversity and inclusion; Noor Akhter, Ph.D., and Mohsin M. Syed, Ph.D., both assistant professors in the UAMS College of Medicine Department of Neurobiology and Developmental Sciences; and Karen Yanowitz, Ph.D., professor in the Arkansas State University Department of Psychology and Counseling. This is the fourth time UAMS has earned the prestigious SEPA funding. Robert Burns, Ph.D., administered the UAMS Partners in Health Sciences Program from 1997-2000. It was funded for a second phase from 2000-2004. In that time, the program brought in millions in grant funding and provided outreach to Pre-K-12 teachers from across the state, giving them science curricula and high-quality teaching tools to take back to their classrooms. In addition, Teresa Kramer, Ph.D., and JoAnn Kirchner, M.D., led the Partners in Behavioral Health Science SEPA program from 2000-2005. For more information about ArkanSONO and for ideas for using ultrasounds to teach science, find ArkanSONO on the UAMS College of Medicine website — Medicine.UAMS.edu — or follow @ArkanSONO on Twitter.